LOS ANGELES, Calif. – At the dawn of the ’80s, The Bangles (then just known as The Bangs), The Dream Syndicate, The Three O’Clock (originally called the Salvation Army), and Rain Parade were all new bands in Los Angeles who formed the core of the small yet influential Paisley Underground scene. In 2013, the four ensembles got back together to share the bill at L.A.’s Fonda Theatre for a charity concert that benefited the non-profit Education Through Music organization. The show went so well and everybody had so much fun that Danny Benair (The Three O’Clock), Steve Wynn (Dream Syndicate), and Vicki Peterson (The Bangles) started talking about doing some type of album to celebrate their Paisley Underground beginnings. The idea quickly formed that each band would cover one song of the three’s. Plans were discussed but lingered. The project didn’t take off until Benair mentioned it to Yep Roc Records co-owner Glenn Dicker, who loved the idea. 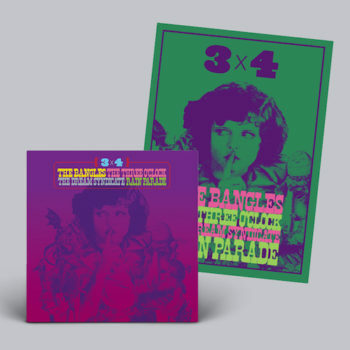 The four groups then got to work, resulting in the terrific twelve-song collection succinctly entitled 3 x 4: The Bangles, The Three O’Clock, The Dream Syndicate, Rain Parade, which Yep Roc will issue on purple swirl vinyl double LP and CD for Black Friday Record Store Day (November 23, 2018) with a wider release (including digital formats). Pre-order now. These grads of Paisley High, Class of ’83, all went on to enjoy long careers in music, and are still active today. The Three O’Clock released several albums in the ’80s for Frontier, I.R.S., and Prince’s Paisley Park labels. They reformed in 2013, with principal members Michael Quercio (vocals/bass), Louis Gutierrez (guitars) and Danny Benair (drums) along with keyboardist recruit Adam Merrin, to perform at the Coachella Music Festival. The Bangles enjoyed wide success on Columbia Records throughout the ’80s with hits like “Manic Monday,” “Walk Like an Egyptian,” and “Eternal Flame.” Their 3 x 4 recordings feature a lineup consisting of all four original members, including bassist Annette Zilinskas. Josh Rouse premieres new video for “Julie Come Out Of The Rain” from THE HAPPINESS WALTZ.